OK so there is this guy that I’ve had a crush on since I was nineteen. I was intrigued by his nasty attitude, skills on the court as well as all the tattoos he has. His name is Allen Iverson and today is his birthday. If you know me then you know during my college days I had every poster, two of his jersey’s (Philadelphia 76’ers), a sneaker (and1), and his mixtape he made. YEAH I BROUGHT IT! 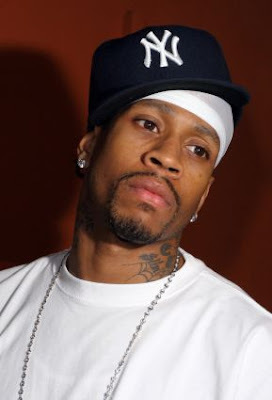 Today's “Eye Candy of the day” is my boo Allen Iverson. HAPPY BIRTHDAY!!!!!!!!! !